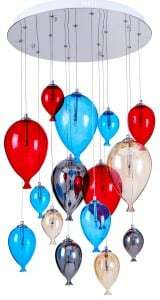 Thank you for submitting your question about lamp children&#39;s hanging balloons - Balloon multicolor 160cm / 40cm 9xG4 20W. 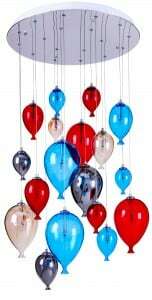 Colorful children's pendant lamp in the form of balloons in various sizes and colors is a unique and magical addition to the children's room. The Balloon lamp will beautifully decorate the room of a small explorer or princess and will fully fulfill its lighting task. It is possible to adjust the amount of overhang and purchase of diffusers in other colors. We also offer a uniform color selection on request.